This beautiful knife has been designed for professional chefs. 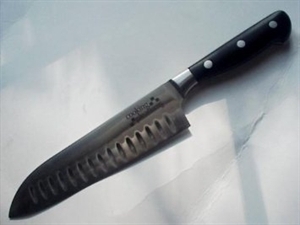 This top rate cutlery features a double forged, high carbon, stainless steel blade that is taper ground and precision honed. It's also triple riveted to the full tang for superior balance and durability. Cooking Pleasures is adorned on one side of the blade. A great gift idea or a perfect steal for your own kitchen!